Some people claim the current climate change has "natural causes". They talk about the changes during the 'Ice Age', thinking the current events must be natural as well. Scientists say that is not the case. The things that caused the changes in the Ice Age are not exactly the same this time. The graph below shows that carbon dioxide in the air has increased and decreased over hundreds of thousands of years. The recent increase in carbon dioxide is much bigger and faster than the natural changes. The most recent glacial stage occurred between 115,000 and 11,500 years ago. The peaks in the graph show times when carbon dioxide was high. Those times are called 'interglacial stages'. Glacial and interglacial stages are linked to regular patterns in the movements of the Earth. Glacial stages begin when those cycles cause cooling. Glacial stages end when those cycles cause warming. These cycles change how much solar energy reaches the Earth. This warming changes the amount of carbon dioxide that can dissolve in the oceans. So in that early phase, the temperature rises first, before the CO2 level rises. (This is why some people say "CO2 lags behind temperature rise" ... which is only true in this special situation). Then as the Earth warms, more carbon dioxide leaves the oceans. The extra carbon dioxide gas in the air then boosts the warming effect. At present, Milankovitch Cycles are trying to cool the Earth. So the current warming is not part of natural processes. Law Dome is a site in Antarctica where scientists have drilled into the ice. 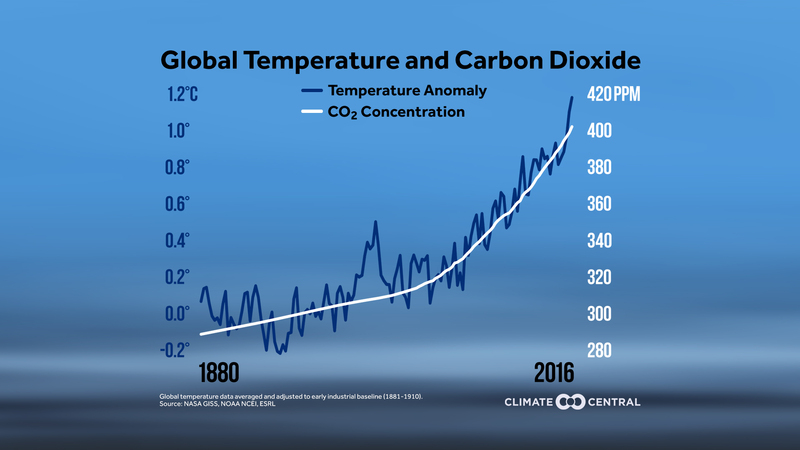 Global temperatures are responding to the recent big increase in carbon dioxide. The extra carbon dioxide has come mainly from burning fossil fuels. The rise in carbon dioxide now means the cycle of glacial and interglacial stages may have been broken. "...the end of the current interglacial would occur within the next 1500 years, if atmospheric CO2 concentrations did not exceed 240±5 ppmv." So carbon dioxide would need to drop a long way below the current level for this interglacial to end.